Will the blockchain be the DRM of 3D printing? Cubichain Technologies and CalRAM LLC., announced that they successfully demonstrated the deployment of a blockchain network to protect the digital data stream for additively manufactured aerospace titanium parts. Using the MultiChain private blockchain platform, based on Bitcoin Core, Cubichain Technologies is developing an application that interfaces with the 3D printing and Additive Manufacturing industry processes to encrypt critical digital data associated with the binary part definition and then store that information on an internationally distributed private blockchain. The information stored on the blockchain provides an immutable copy of the original encrypted data that is used to verify that transmitted copies of the digital part data have not been altered, tampered with or otherwise hacked. The demonstration provided proof that the Cubichain technology can easily identify part files which have been tampered with by recognizing the ?difference in a single data bit? in the binary part file. ?Both additive manufacturing and blockchain networks are disruptive technologies?combining the two will undoubtedly revolutionize the future of manufacturing. We see the greatest threats to additive manufacturing as cyber-physical hacking and counterfeiting?the deployment of a blockchain can combat both. It?s very exciting technology,? stated Shane Collins, Director Additive Manufacturing Programs for CalRAM. Photo of a topology optimized 3D printed Ti-6-4 aerospace part employing part build data transmitted and verified using a Cubichain network and embedded hash encrypted serial number. CalRAM integrated the blockchain hash serial number during the printing cycle. It is anticipated that addressing the $1.7 trillion/year product counterfeiting market will lead the way for cross-industry adoption of the Cubichain solution and the novel blockchain approach. The ultimate deployment for the blockchain is when there is an immutable identification embedded in the part that cannot be altered and it is preserved in an equally immutable ledger. 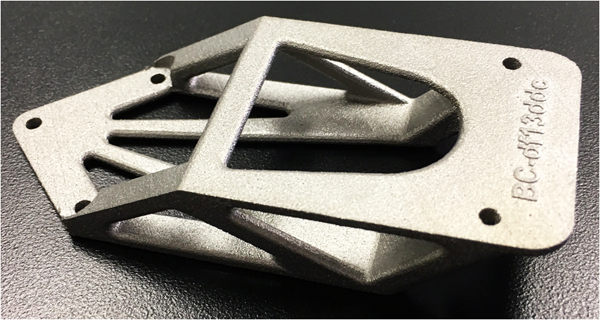 This capability is uniquely within reach of the Additive Manufacturing industry through the use of layer-wise build inscription of identification in the part during the build process as shown in photo of the aerospace titanium part built by CalRAM employing the Cubichain data management. Through the integration of these leading edge technologies in a standardized process, counterfeiting high value, mission critical parts will become exceedingly difficult and no longer profitable. According to Dr. Kenneth Newell, co-founder of Cubichain Technologies, ?In the next few years, strategic deployment of additive manufactured parts is anticipated to increase exponentially while the ability to protect the digital stream will outstrip existing centralized cyber-security measures giving way to the scalability and unbreakable security of the blockchain. Like Everledger for the Diamond industry, Cubichain wants to define an industry standard for manufacturing data security and elimination of counterfeit parts worldwide. What we accomplished today provides the proof-of-concept for a much larger closed-loop solution currently being developed. ?